The California State University, Northridge Music Department has a long history of not only providing CSUN’s music students with an education and degree, but also providing the campus community with exceptional musical performances. As part of their effort to educate and entertain, they have brought the community a variety of guest musical performers. CSUN's University Archives is home to a portion of the Music Department’s records, the majority of which are performance programs. Those from Guest Artist Concerts/Recitals date from 1969 to 2007. 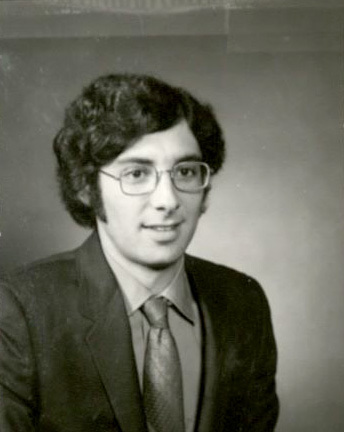 Master oudist and SFVSC alumnus John Bilezikian (class of 1970) performed in the Music Recital Hall (Cypress Hall) in 1973. His career saw collaborations with such diverse talents as Leonard Cohen, Little Richard, Luis Miguel, and Placido Domingo. Bilezikjian also performed traditional Armenian music, and was a guest artist with the Los Angeles Philharmonic and the Boston Pops. 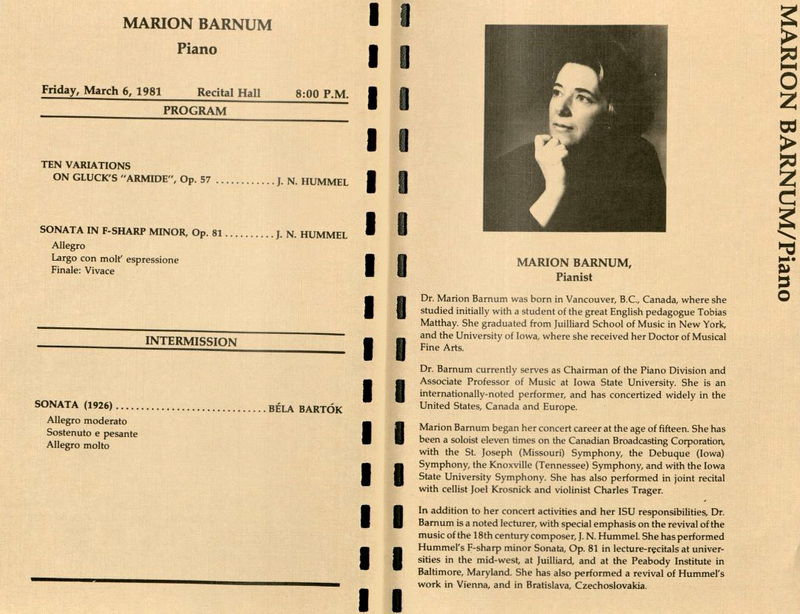 Pianist Marion Barnum is well known for her efforts in assisting the revival of the works of 18th century composer J.N. Hummel. 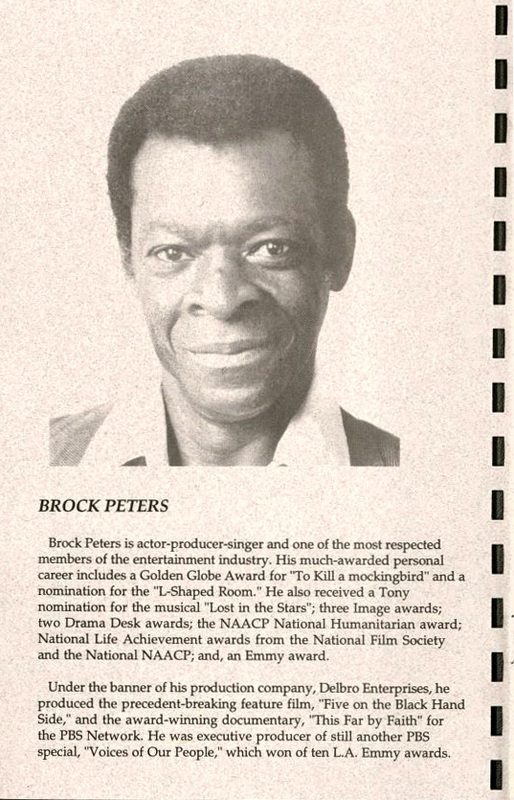 Her March 6, 1981 concert in the Recital Hall showcased some of his work. In fact, Barnum played Hummel's Sonata in F-Sharp Minor, Op. 81 at universities throughout the country, as well as at a special concert in Bratislava, Slovakia, where Hummel was born. 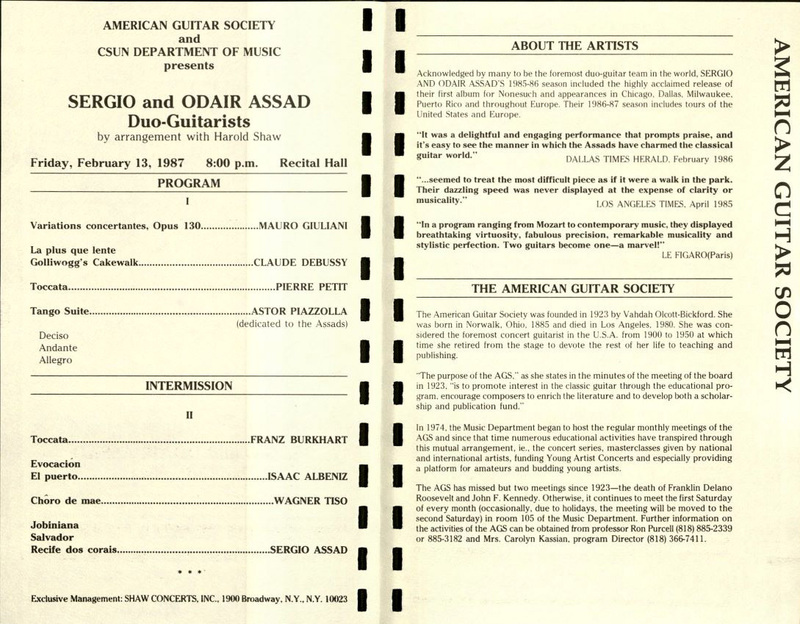 On February 13, 1987 the Brazilian guitar duo the Assad Brothers, Sergio and Odair, played the Recital Hall as part of the American Guitar Society-CSUN Guitar Concert Series. 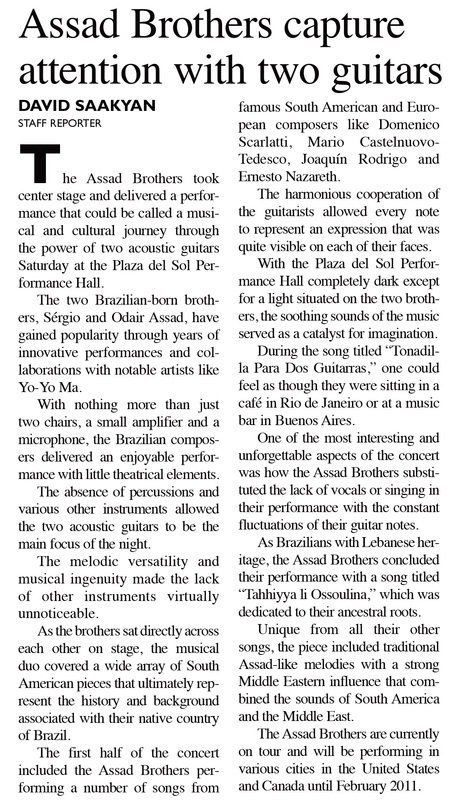 They returned to the Recital Hall in 1990 and played the Plaza del Sol in 2010. In a 1990 program, we learn that the brothers were discovered by a newspaperman in Sao Paulo in 1968, when they were just twelve and sixteen years old. They then went to Rio de Janeiro where they studied with Mme. Monina Tavora, a disciple and former pupil of maestro Andres Segovia. In another nod to world music, the department presented Classical Ragas, a demonstration and recital of North Indian Classical Music in March 1991. The program describes raga as melody. “A raga is formed from a series of ascending and descending notes selected from a given music scale. Within this skeleton, the musician brings out the melodic content that gives a particular raga its character and mood: joy, sadness, romance, peace, or a combination of these and other basic emotions.” During the recital David Trasoff played the sarod, Tim White played the sitar, and Tim Witter played the tabla. 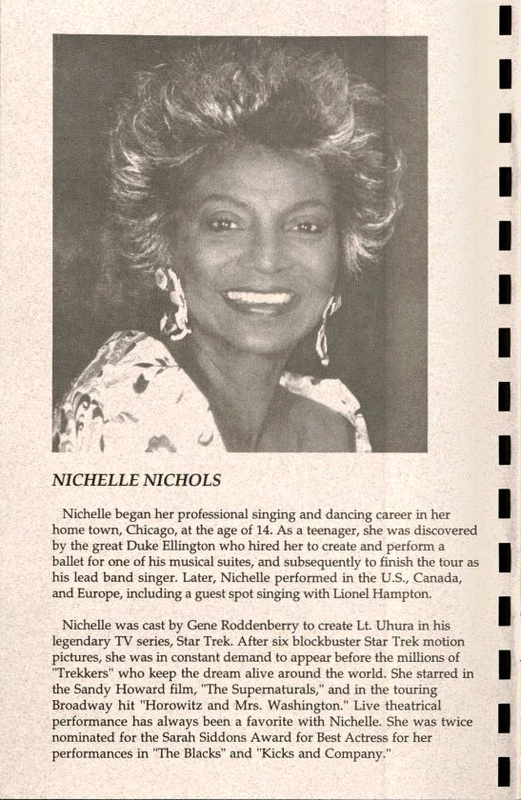 As part of the May Music Festival in 1995, Nichelle Nichols, best known for her role as Lt. Uhura in the original Star Trek television series, and actor Brock Peters (To Kill a Mockingbird, Roots, Mississippi Burning) performed with the CSUN Symphony conducted by David Aks. The performance, titled “Music, Poetry and Love,” included songs like From this Moment On, Young Lovers, and Everybody’s Talkin’. The Daily Sundial inaccurately reported this concert as the “official grand opening” of the Performing Arts Hall at the University Student Union, but described the performance positively. The newspaper subsequently published a letter to the editor correcting the error. These are just a few of the highlights from the Music Department's collection. The music programs in conjunction with other sources can provide an interesting look at an under explored history of the Music Department; it can test your knowledge, or just simply provide a stroll down memory lane.